A Google product feed lists information about your products in a specific format. Typically it contains a product image, product id number, title, and attributes. This information is given to ecommerce websites, search engines, price comparison sites, affiliate networks, and more. Manufacturer and retailers generate this information to help get their products into search engines. Update: Google has released some new requirements to their data feeds. Click the link toward the top of the page to set up your Google Merchant Account. 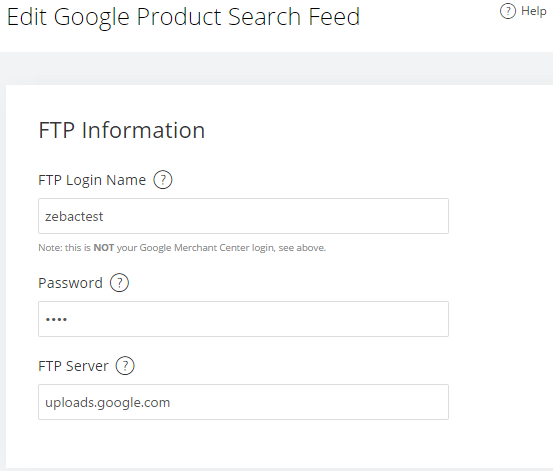 After setting up and logging into your Google Merchant Account, navigate to Settings > FTP. 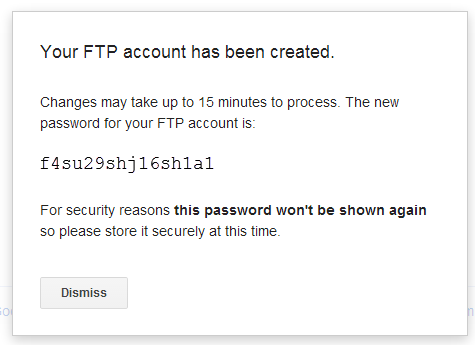 Set up a username and then you will be prompted to save, and it will give you an FTP password. Next, navigate to Data Feeds and enter a new data feed. Your data feed will need to have a .txt extension. Click New Data Feed and enter a name for the feed. This will also be input into the AmeriCommerce online stores admin panel. After setting up your Google Merchant account, click New. Here you will enter your password and filename on the AmeriCommerce online store admin console. Don't forget to select your store. Once you mark the feed as active, a file will generates every 24 hours and put in your root folder of your website. Google will pull this file everyday. *It is required to provide this attribute if you have specified a global shipping rule in Settings that is dependent on shipping weight. product stock status - can be overridden by a custom field named "Availability"
*Defaults to new unless a matching custom field is supplied. *Required only for products listed as apparel. Note: There are certain product fields that Google utilizes, yet do not correspond to any specific field in AmeriCommerce. These are indicated in the grid above. Enter AmeriCommerce online store product custom fields. So that our clients are able to use all available fields, we have enabled the ability to map specific custom fields to these missing attributes. To simplify this process we now create these fields automatically for you. 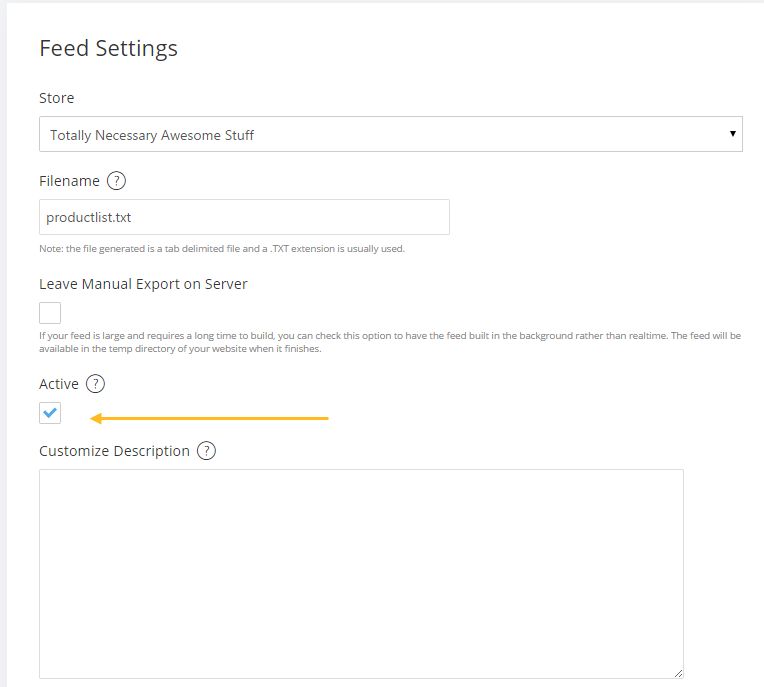 After setting up and saving the feed visit any of your products currently setup. You should see the corresponding section under the "General" tab. Codes and characters will also not be accepted into a feed. Also, make sure that all URL's are the full URL and not custom page extensions, etc. Navigate to Catalog > Variant Groups after setting up the variant groups. You can enter the product variant information under the variant/custom tab on the product. Navigate to Tools > Apps and Add Ons. 3) Select the Store the Feed should apply to. *Note: The product feed file you named above will be loaded into your store's root directory. The URL to this file is your domain plus the file extension. For example: http://www.yourdomain.com/yourfile.txt. Paste your file's URL into your Google Merchant Center Settings. Having a hard time following the process here... instructions seem incomplete and a little un-organized. "Google Product Search" export tool has been down for two months, any eta yet?